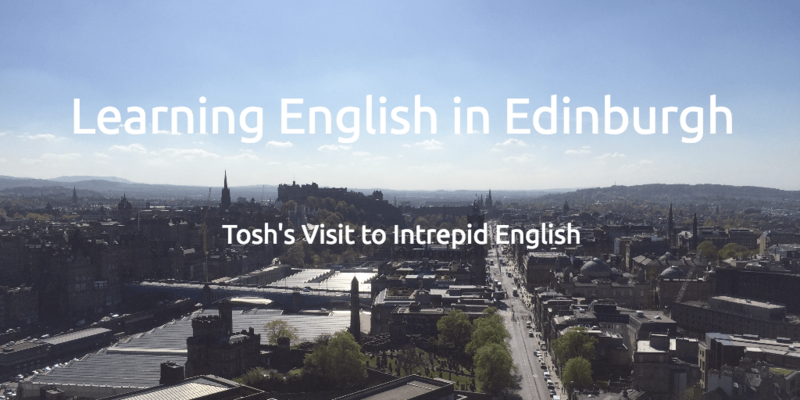 This month, Intrepid English student, Tosh, came to Edinburgh to study English and explore the city. I had the great pleasure of showing him around and I thoroughly enjoyed teaching English whilst exploring Scotland's beautiful capital city. 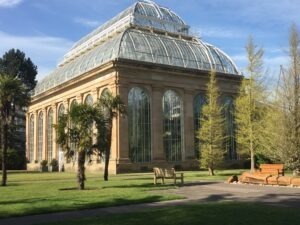 We managed to fit a lot into five days including a walk along the cobbled streets of the Royal Mile to Holyrood Palace, a trip to the Royal Botanic Gardens and walks to the top of Calton Hill and Salisbury Crags. 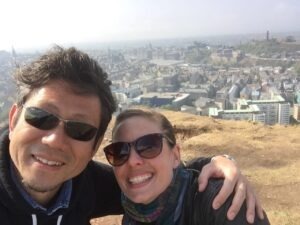 It was an amazing experience for me to visit Edinburgh and have English lessons with Lorraine for one week. Though my original purpose of this visit was to improve my English with intensive lessons, I could also enjoy the city very much! Lorraine offered me 3 hours of lessons per day combining the English lessons and a city trip, which was a very good balance for me. On the first day, we met at a café called “The Elephant House”, which is famous for being the 'birthplace of Harry Potter'. After a discussion about our lesson plan at the café, she showed me around the city. The first impression of the city for me was that the city doesn’t just keep old buildings but the whole city consists of ancient structures. By the third day, we had visited several old monuments; Edinburgh Castle, Scott Monument, Calton Hill, Greyfriar's Bobby, and more. All the monuments were really impressive, but what I found interesting was that Scottish people are sometimes ironic in their expressions about their heritage. On a plaque at the Scott Monument, the description begins with Charles Dickens’ words “I am sorry to report the Scott Monument a failure. It is like the spire of a Gothic church taken off and stuck in the ground.” In addition, one monument on Calton Hill is locally called “Edinburgh’s Disgrace” as the structure has stood incomplete for over 200 years because of a budget shortage at the time it was built. 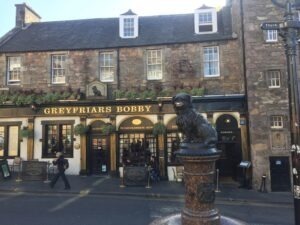 Japanese people might find it interesting that the statue of a dog called Greyfriar's Bobby has the similar story to the famous Japanese dog called Hachi-ko which is also displayed in the courtyard of Shibuya station. Tokyo. 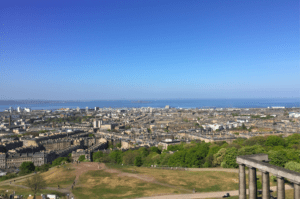 On the fourth day, we went running for about 12km and also went for a trek up Salisbury Crags, which is the sloping hill close to Holyrood Palace near the centre of Edinburgh. It was definitely the most intensive day in terms of both physical and mental effort, but also, the most effective day for my English study. I realised that simultaneously having mental and physical stimulation is the most effective way of studying! The beer and meal we had together after this day was unforgettable, of course. The last day included a summary of our lessons and we spent some time in a café discussing some serious issues about British society. That evening, I also enjoyed watching a big rugby match at Murrayfield stadium! Great thanks to Lorraine, my one-week intensive English training course was very successful. 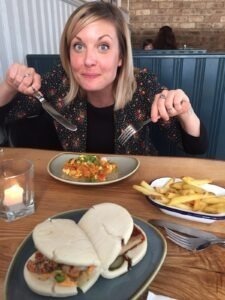 I would definitely recommend a similar experience to anyone who is eager to improve his/her English and to enjoy Scotland. 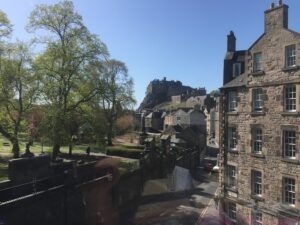 Would you like to visit the beautiful city of Edinburgh? 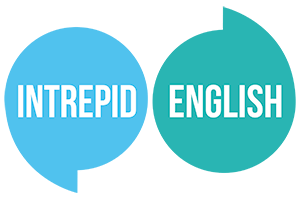 If you would like to join us for the next Intensive English City Tour in September 2018, please email us at Intrepid English to find out more. Details will be released in the coming months, so make sure you sign up to our newsletter to get all the latest news and English language tips straight to your inbox. This blog post is available to download as a PDF. Click the 'Print Friendly' button below to get a copy.